As a byproduct of historical development, there are different, unrelated systems of nomenclature for "inorganic chemistry", "organic chemistry", "polymer chemistry", "natural products chemistry", etc. With each new discovery in the laboratory, as well as each new theoretical proposal for a chemical, the lines that traditionally have separated these "distinct" subsets of matter continually grow more blurred. This lack of uniformity in characterizing and naming chemicals increases the communication difficulties between differently trained chemists, as well as other scientists, and greatly impedes progress. 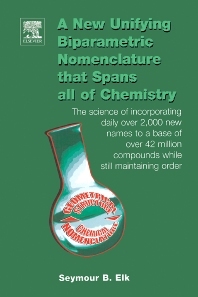 With the set of known chemicals numbering over 42,000,000 (in Chemical Abstracts' data base) and continually growing (about 2,000 new additions every day), the desirability for a unified system for naming all chemicals simultaneously grows. Moreover, in order to meet the requirements of disparate groups of scientists, and of society in general, the name assigned to a given chemical should, not only uniquely describe that substance, but also should be a part of a readily recognizable order for the entire field. For these purposes, a topology-based "bi-parametric" system of nomenclature is herein proposed. Undergraduates in chemistry and their teachers of nomenclature courses, researchers in mathematical chemistry, molecular structure, physical & theoretical chemistry, (in)organic chemistry, polymer chemistry, organometallic chemistry, heterocyclic chemistry, specialists in nomenclature, structure and compound naming, and chemical information specialists. Other Significant Difference From Existing Systems. The Boranes And Related Aluminum Compounds. Elk Technical Associates, New Milford, New Jersey.